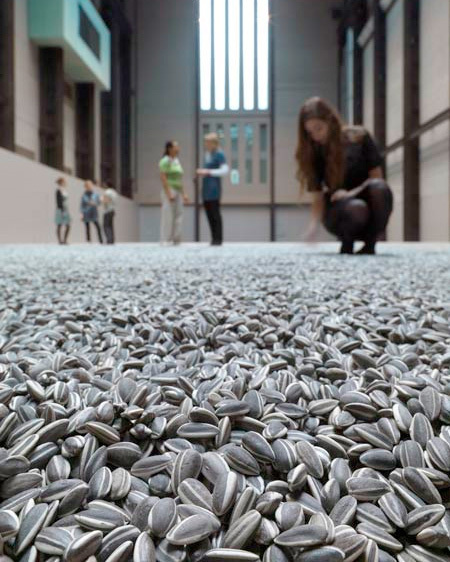 Ai Weiwei’s unique art exhibit consists of one hundred million realistic looking sunflower seeds made out of porcelain. 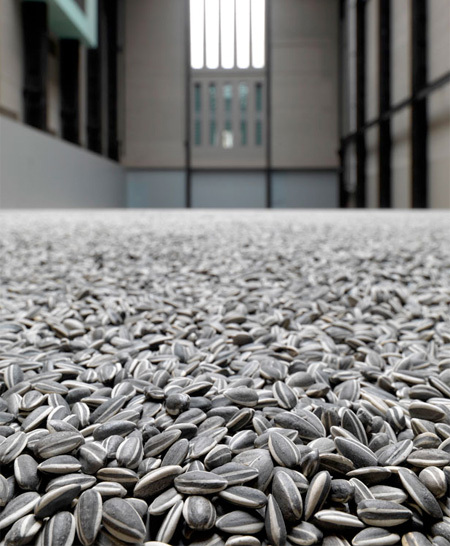 Each seed was hand painted by an army of 1,600 Chinese artisans and scattered all over the floor of the Tate Modern’s Turbine Hall in London. Unfortunately, due to possible health issues caused by dust, visitors are no longer allowed to walk across the floor and pick up seeds. It’s cool and it’s full of passion and hope if you know how hard has he been trying to promote the democratic progress in the mainland of China. Sunflowers seeds…the seeds for lights. Due to the dust, the exhibit was removed entirely. This is/was a beautiful exhibition and the work that went into in says something about the Chinese people. Mao and the cultural revolution or not, these are an ancient people. One can only hope that someday, they will get out from under the yoke of communism. kinda lame i have to say. Very cool. I would love to walk out into the middle of it and just lay down. Nothing more than that. That means that each artisan would’ve had to have made 62,500 seeds a piece. Geez. At first I thought it was pointless, but again, after watching the video and what it represented and offered the local community, it’s inspiring. If you are a mouse, or a chipmunk, pretty sure this was the exhibit is what you’ve waited for your whole life. Sometimes it’s just about composition, and bringing an idea to life, and not proposing a practical idea. Very routine things of our modern life were once felt like a taboo… Raw concrete decoration, pants for women, men not having a mustache… Thanks to courageous people like this artist we are enjoying the freedom of using these “once unconventional” matters. To three of the four posters above me, they’re not real sunflower seeds, they’re made of porcelain… I just think it’s great that they employed 1,600 artisans. People need work. I really didnt appreciate the scope of this until I watched the movie. Although the exhibition may seem silly, this artist employed nearly a whole town, which used to be responsible for royal pottery making. A heritage which he make have helped reinstate in that city. Sunflower seeds are one of my favorite seeds. I love sunflower, too. Those are such amazing, full of hope and love. Love it! I was in Tate few days ago, It’s really amazing! Why!? What a waste of time. I like art, I like new ideas, I like heritage; 1600 Chinese Artisans each painting 62.500 (?) small pieces of porcelain. But the sentence “the dust which could be damaging to health following repeated inhalation over a long period of time” makes me wonder. 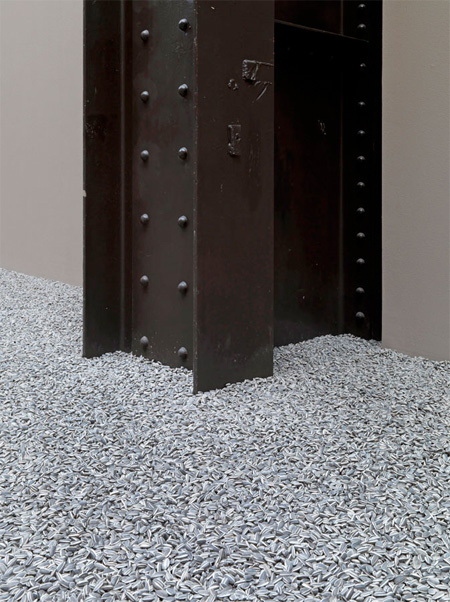 Wondering about art, about heritage, about the artist employing a whole town, about China. Maybe it is time for “people-friendly art” or “green art”. Now I even wondering about myself. but, watching the video i felt like it was a lil bit slavery the employment of that town… my english its not to good, but i thought in analogy between nike employing thousands chinesse people to produce something to the mass consumers, and this artist, using 1600 men and women to produce hes artwork to be enojoy by a few or selected group of people…. 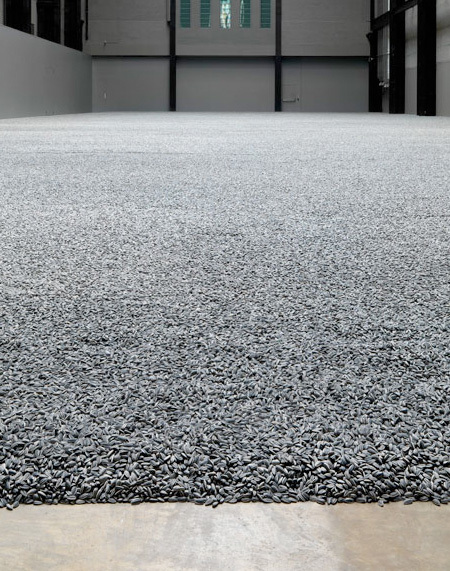 hm i think employing 1600 people to work for what they consider to be decent pay, at times even in the comfort of their own home (in the video, the artist mentions that some people took the porcelain seeds home to paint them at their convenience), is quite different from being forced to work in a sweatshop with horrible conditions and low pay.